Though simple in design, this email takes advantage of a powerful design technique: the “F” reading pattern. Can you see it? 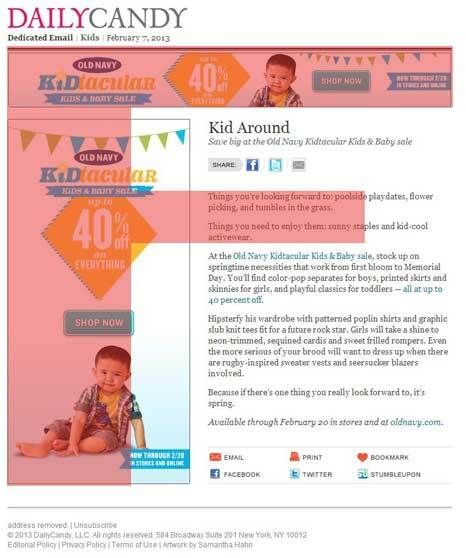 Old Navy took advantage of this reading pattern by creating an email layout that makes sure their call to action and pertinent sale information fall within the “F.” Readers who see the sale information and are interested will read the small article included in the email if they want more information, or just click right through if they’re ready to shop. Including an article with the sale info makes this email a lot more shareable, especially with those conveniently placed “share” buttons. All of this design wouldn’t help much if they hadn’t chosen a powerful incentive, but I think most parents’ eyes will light up on seeing “up to 40% off on everything.” Even though not all items will be at 40% off, this incentive should get lots of people clicking through to check out their site and the deals they offer. This sale email may be for kids, but it’s going to get some serious attention from parents. They definitely won’t kid about their design. They very well crafted their this product too. Readers who see the sale information and are interested will read the small article included in the email. it is like an email revolution. thank you.